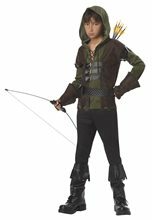 Renaissance Boy Child Costume.Includes: Top with vest, pants and matching cap. The white renaissance top comes with a brown vest and pants, and matching brown flop cap. Renaissance Bride Toddler Costume;Renaissance Bride Toddler Costume A Beautiful Little Bride To Be! Costume Includes: Satiny gown with lace-up bodice and flowing inset, gold accent lace sleeves, headpiece and veil.